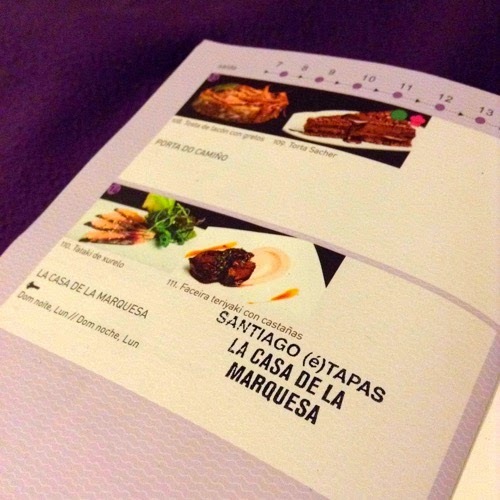 This weekend Santiago de Compostela’s seventh annual concurso de tapas or tapas competition finally came to an end after half a month of exciting bites served on black slate tablets. I was disappointed that it was over, but my gut and my wallet were relieved. Organized by Santiago’s association of hotels and restaurants, it was a clever way to stimulate the local economy as it enters low season (and as the rain begins to keep folks at home). For a flat price of 2€, you could go into any participating café, bar, or restaurant and order their tapa del concurso—which made it a great way to explore higher-end restaurants that otherwise might be out of your budget. As you went from place to place, you got your passport stamped to prove you ordered their tapa, and you also filled out a little voting card to rate the tapa itself, the quality of the service, and the “tapa con chispa” or the creative “spark” conveyed by the tapa. I really enjoyed this two-week celebration of the tapa, or a little bit of food that, at least in Galicia, you receive for free as part of your drink order at a restaurant. Traditionally it’s nothing too fancy—a small bowl of stew, a mini sandwich, or chips and olives—but for the contest most restaurants went all-out and served some really outstanding (and tasty!) creations. I loved getting to explore some of my favorite neighborhoods like the northern half of the old town or San Pedro while also getting to taste some unique flavor combinations that often recalled typical Galician cooking. 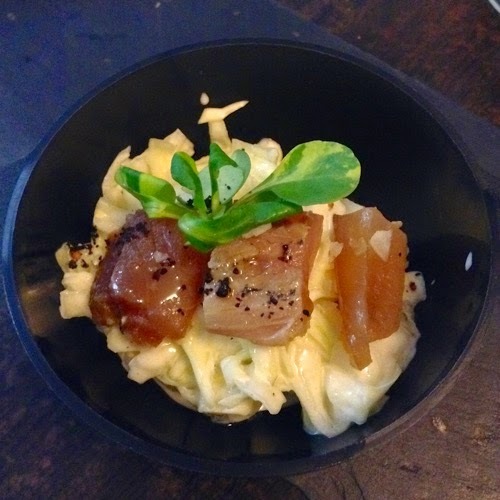 What: A base of cabbage and apple salad, which surprised me with its similarity to American-style coleslaw, supported three chunks of Japanese-style tataki or rare, lightly-seared mackerel. 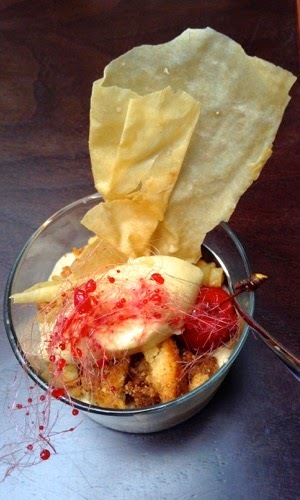 This was my first foray into the tapas contest and still one of my favorites from the whole month. 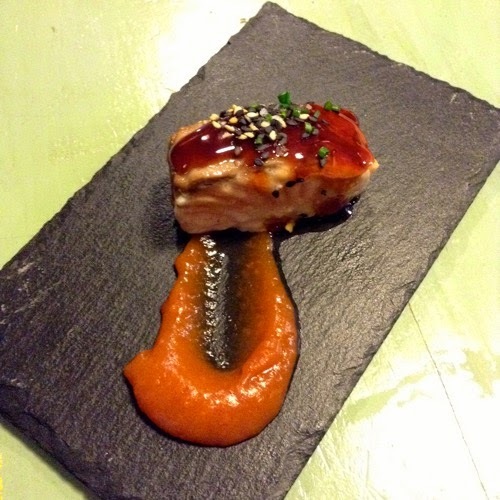 What: Three bites of warm, flaky, flavorful teriyaki salmon were paired with a sauce made from kimchi (Korean spicy pickled cabbage). 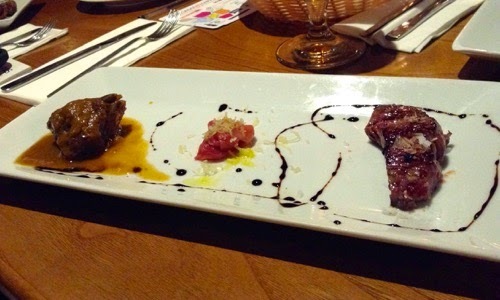 A fitting tapa from this Asian-Galician fusion restaurant. What: Another entry with tataki mackerel, although this tapa was served by a nice Japanese restaurant just outside the old town. 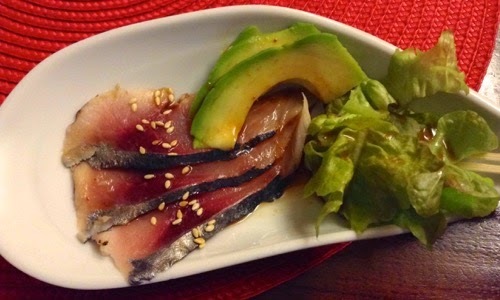 I liked the simple combination of sesame seed-garnished fish with avocado slices. What: Inspired to go here by the name alone—“cow cubed”—I was 2/3 impressed with what I got. I loved the warm, melt-in-your-mouth stewed beef cheek, and the sirloin carpaccio had a nice flavor, but the tenderloin steak was a little tough and chewy. 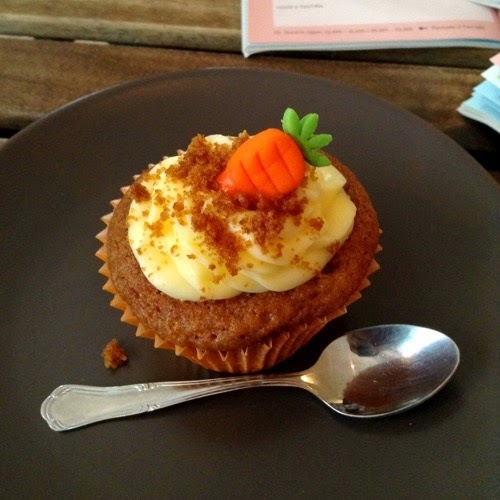 What: I was surprised when I learned that my go-to café for top-notch coffee and generous free tapas was participating in the competition, as it’s an unassuming establishment along the new town’s main thoroughfare. But they’ve won awards for their coffee and their homestyle tapas are always fresh, so I looked forward to trying what the head barista-chef at Venecia would cook up. 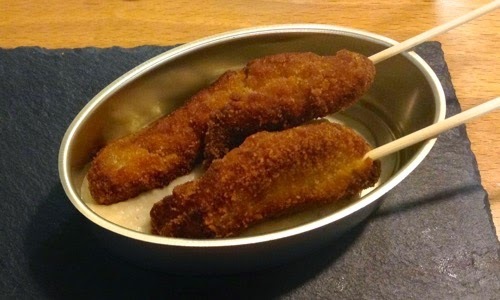 A layer of byesar or Moroccan-style hummus made from fava beans enveloped two skewers of fried chicken that had been marinated in soy sauce and Ethiopian coffee. A simple, African-inspired tapa that tasted delicious. What: I came here partly to feel a little fancy in a four-star hotel’s café (based out of a living Franciscan monastery!) and partly to satisfy my fried squid cravings. 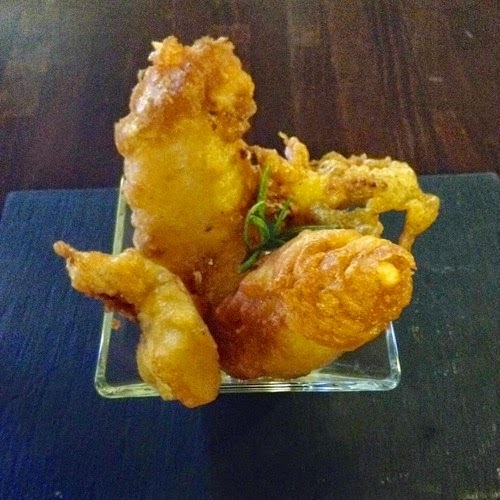 This tapa consisted of baby squid fried in a mango-tempura batter with lime mayonnaise on the side. I honestly didn’t think it was all that creative, but in the end it was a typical Spanish dish—chipirones fritos—done very, very well. Which of these tapas do you think sounds the tastiest? 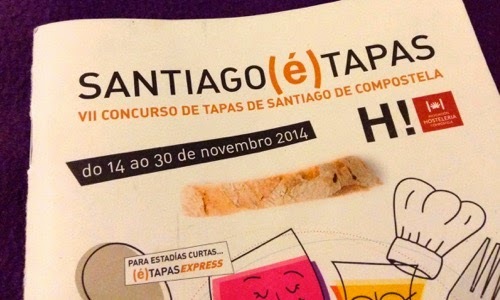 Have you experienced any other tapas competitions in Spain before? Share below in the comments!